Power Trackbarrow with Hydraulic Assist. Yardmax introduced a new line of all-terrain power dumpers. Products in the new line include a power track barrow with hydraulic assist, power track barrow with gas shock assist in hopper or flatbed styles, and a power wheelbarrow. Yardmax standard features include solid-steel parts; all-terrain, heavy-duty wheels and tracks; and Briggs & Stratton engines. Yardmax said its power track barrows and wheelbarrows are designed to safely and efficiently transport heavy loads and are engineered for optimal balance and control. “At this price point, no one in the market sells power barrows that compare to the features, design and durability of the Yardmax line,” said Shad Shafer, Yardmax vice president. 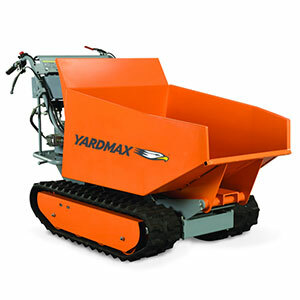 Offered in multiple styles and weight capacities, the Yardmax line of track barrows includes a Power Trackbarrow with Hydraulic Assist, with a 1,100 pound capacity, and Power Trackbarrow with Gas Shock Assist, with a 660 pound capacity, in hopper or flatbed style options. Machine features include removable flatbed sides, the 900 series Briggs & Stratton engine, track for all-terrain traction control, multiple-speed transmission and instant stop safety controls. The compact power wheelbarrow has a load capacity of 660 pounds and offers traction and stability needed to move heavy loads across rugged, uneven, muddy and wet landscapes, the company said. Product features include directional AG tires, one-handed release, two position-enabled controls and multiple speed heavy-duty transmission. The line is initially available for purchase or preorder at Amazon.com, Hayneedle.com, Jet.com and independent retailers nationwide.